Kích thước của hình xem trước: 487×599 điểm ảnh. Các độ phân giải khác: 195×240 điểm ảnh | 390×480 điểm ảnh | 488×600 điểm ảnh | 624×768 điểm ảnh | 832×1.024 điểm ảnh | 2.480×3.051 điểm ảnh. Lịch sử tác phẩm This is one of the paintings removed from the Royal Collection and taken to the Napoleonic Museum in Paris. It entered the Prado Museum in 1827. English: Wearing his customary black clothing and high hat, with the Order of the Golden Fleece on his chest, the Monarch holds a rosary in his left hand, alluding to the institution of the Rosary Festival by Pope Gregory XIII. This festival was to take place annually on the first Sunday of October to commemorate the victory over the Turks at the battle of Lepanto on 7 October 1571 and the triumph of Catholic faith. 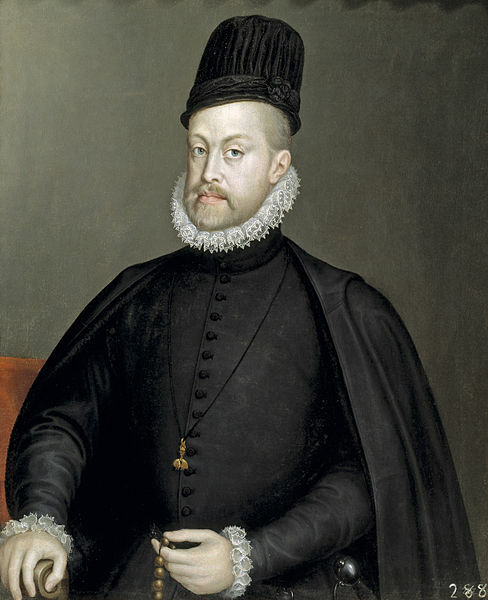 This portrait was made while Felipe II was married to his third wife, Isabel de Valois. Sofonisba Anguissola was one of the queen's ladies in waiting as well as her painting teacher. In 1573, Anguissola changed the placement of the King's hand —it previously touched the Golden Fleece— in order to adapt it to the portrait of his fourth wife, Ana de Austria (P1284), with which it is paired. Anguissola's close working relationship with Alonso Sanchez Coello meant this painting was falsely attributed to him or Juan Pantoja de la Cruz, however only recently has this painting been recognized to have been Anguissola's work. danh mục: Inv. Felipe IV, Alcázar de Madrid, 1636; mã số danh mục: s. n.